As producer/advisor, Harold A. Geller notably shared in six Telly Awards for his work. BURKE, VA, August 16, 2018 — Marquis Who's Who, the world's premier publisher of biographical profiles, is proud to present Harold A. Geller, DA, with the Albert Nelson Marquis Lifetime Achievement Award. An accomplished listee, Dr. Geller celebrates many years' experience in his professional network, and has been noted for achievements, leadership qualities, and the credentials and successes he has accrued in his field. As in all Marquis Who's Who biographical volumes, individuals profiled are selected on the basis of current reference value. Factors such as position, noteworthy accomplishments, visibility, and prominence in a field are all taken into account during the selection process. An observatory director and associate professor at George Mason University in the department of physics and astronomy since 2006, Dr. Geller teaches various courses, including Astrobiology, Energy and the Environment and Astrobiology Topics. He also served as the associate chair of the department for two years beginning in 2006. Some of Dr. Geller's expertise includes computer-based systems for GIS, remote sensing systems, artificial neural network applications, computer simulation and modeling, analog and digital electronics subsystems and computer-aided design and engineering. Prior to Dr. Geller's work in academia, he served as the deputy director of Washington operations at the Consortium International Earth Science Information Network, project manager at Research and Data Systems Corporation in Maryland and research assistant at the National Research Laboratory in Washington, DC. He also worked in various other roles dating back to 1972 when he first worked as a research assistant at the State University of New York at Downstate Medical Center in Brooklyn, NY. Dr. Geller was involved as an award-winning tour guide and lecturer for NASA's Goddard Space Flight Center and lecturer and operator at the Einstein Planetarium in the National Air and Space Museum and the Smithsonian Institution, among other roles. Dr. Geller served as a co-investigator, STEM team member and consulting scientist for the Virginia Initiative for Science Teaching and Achievement. Affiliated with multiple professional organizations, he is a past president of the Potomac Geophysical Society, former chairman of multiple committees with the American Institute of Aeronautics and Astronautics, former media relations officer for the Astronomical League, former vice president of the American Association of Community Colleges and longtime member of the American Geophysical Union and the American Astronomical Society. The author of several books, including “Renewable Energy: A First Course,” Dr. Geller released a revised edition in 2018. The book focuses mainly on renewable energy, but also addresses nonrenewable energy, including fossil fuels and nuclear technology. The coverage extends from the basic physics to conservation, economic and public policy issues, with a strong emphasis on explaining how things work in practice. Other books include “Multigenerational Starship Design Considerations” in 2015 and “A Pluto Story” in 2015, among several others. 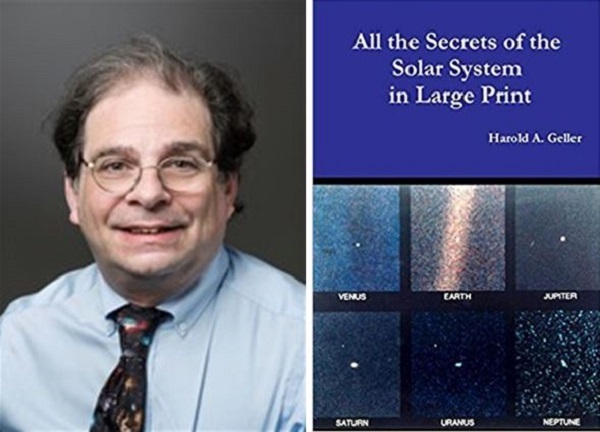 Dr. Geller has authored and contributed articles in various education, astrobiology, astrophysics and biochemistry journals as well, served two years as a producer and advisor for Astrocast TV between 2008 and 2010, and has produced two successful educational multimedia CD-ROMS. As producer/advisor, he notably shared in six Telly Awards for his work. Earning an Associate of Science at Northern Virginia Community College, Bachelor of Science at the University of the State of New York and Master of Arts and Doctor of Arts in education at George Mason University, Dr. Geller is also certified in college teaching through George Mason University. He has been the recipient of multiple awards throughout his career, including a Most Accomplished Alumnus Award in Physical Sciences from Midwood High School in 2016, Faculty Member of the Year from George Mason University in 2008, and several Volunteer Service Awards from NASA's Goddard Space Flight Center. Dr. Geller has been included in more than 70 editions of Who's Who in America, Who's Who in Science and Engineering and Who's Who in the World. In recognition of outstanding contributions to his profession and the Marquis Who's Who community, Harold A. Geller, DA, has been featured on the Albert Nelson Marquis Lifetime Achievement website. Please visit www.ltachievers.com for more information about this honor.